Posted 4 October 2009 by Richard & filed under Biographies & Pen Portraits. Born in Lavagh in Ireland James Booth attended Trinity College Dublin (founded in 1592) to study mathematics. Trinity College was a highly regarded institution and possessed a considerable reputation among other universities in Europe particularly in Mathematics and Astronomy with such distinguished individuals as Bartholemew Lloyd, William Hamilton, James McCullagh and John Brinkley. Interesting that Trinity College already had a well-established examination system which subsequently influenced James Booth later with his work for the Society of Arts (SoA/[R]SA. It most be noted too that Ireland produced many remarkable individuals who made major contributions to astronomy, engineering, mathematics and the physical sciences. Although a number had to emigrate to England and America because of limited opportunities within Ireland they enriched these countries with their considerable talents. Some of the contributions made by Irish scientists are recorded in the book entitled ‘Science in Ireland’ (1). Booth left Ireland for England somewhat disillusioned after unjustifiably failing to gain a Fellowship at Trinity. He felt strongly that his mathematical work was not given the recognition that in rightly deserved. After a year he was appointed Principal and Professor of Mathematics at Bristol College. He left Bristol College to take up a post as Assistant Principal at the Liverpool Collegiate Institution where he continued his mathematical research and teaching. During his period at Liverpool he became a member of the Liverpool Literary and Philosophical Society in 1844and its President in 1846. During this period he travelled a great deal to London giving lectures at the Royal Society for which, along with his other mathematical researches on conic sections and coordinates, he received a Fellowship of the Society in 1846. Booth left Liverpool in1848 and went to London where he became an active member of the Society of Arts. He was also involved in establishing the Mechanics Institute in Wandsworth in 1853. 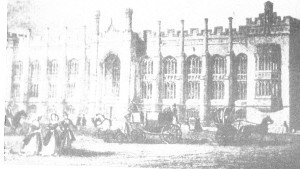 A print of the Liverpool Collegiate Institution is shown below. James Booth became a major figure during the Victorian times as a propagator of the concept of universal popular examinations. He was ordained into the Church of England and although a deeply religious man achieved little in this vocation. His legacy was very much associated with the work he did with the Society of Arts, technical education and the examinations he introduced. The Society of Arts (SoA/[RSA] had been founded in 1754.Booth was a very strong believer in free trade and competition the principles of which he wished to apply to an examination system. He subsequently became the key figure in getting the Society to stage public examinations. Booth more than any other person was responsible in establishing the Society of Arts as an examining organisation. In addition to Booth two other individuals can be identified as responsible for introducing examinations at the Society of Arts, namely Harry Chester and James Hole. James Hole was a very active member of the Mechanics Institute movement whilst Harry Chester was the key figure in the creation of the Union of Institutes (see history of technical and commercial examinations). All of these individuals advocated the importance of examinations in order to improve the effectiveness and management of the Mechanics Institutes. Foden (2) states ‘that Chester and Hole set the ball rolling in regard to the Society of Arts examinations whilst Booth gave the development direction and momentum’. A list of suitable subjects for examination should be prepared for approval by the “Conference”. Candidates might enter for any subject offered, but no candidate, after his first examination, might take up more than two subjects in the same year; a thorough knowledge of one or two subjects being far more important than superficial acquaintance with subjects. This list highlights the vigorous approach Booth expected from the examination system. The examinations consisted of four sections and candidates sat two papers of two-and-half hours duration. Male candidates had a choice between two groups of topics: first consisting of such subjects Building and Agriculture, Elementary Physics, and Mechanics and the second offered: Anatomy, Meteorology, Physics and Physiology. For female candidates there were papers including Everyday Life and Conditions, Physiology and Domestic Economy. 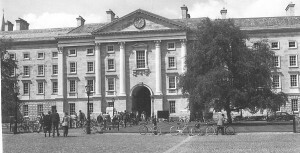 A recent view of Trinity College Dublin where Booth studied mathematics is shown opposite. The first examinations were held on 10th June 1856 in the Society’s Great Room. Booth was at this time was chairman of the Society of Arts Board of Examiners. The second round of examinations was held in June 1857, in London and Huddersfield with 80 and 140 candidates respectively. More subjects were added including specialist divisions of science and mathematics. In addition non-scientific and mathematical subjects were introduced e.g. Bookkeeping, English, French, Geography and History. The examinations grew in popularity and thus began the examinations system we know today. The development of examinations was largely due to James Booth and the Society of Arts and a few other enthusiasts. The examinations of the Society of Arts subsequently had a significant influence on the development of the Oxford and Cambridge examination system. Unfortunately his relationships with the Society of Arts soured and he parted from the Society with a great deal of bad feeling and acrimony. Sadly he died a somewhat bitter man feeling he had not received the recognition he deserved both as an educator and mathematician. There is an uncanny resemblance with the life of Charles Babbage who also felt undervalued in his time. However history now recognises Booth as the major figure in creating the English examination system and also as an exceptional example of a pioneer of technical education and ‘diffuser of useful knowledge’ (a term much used in Victorian times and by later historians). (1) Nudds. J, McMillan. N, Weaire D and McKenna Lawlor. 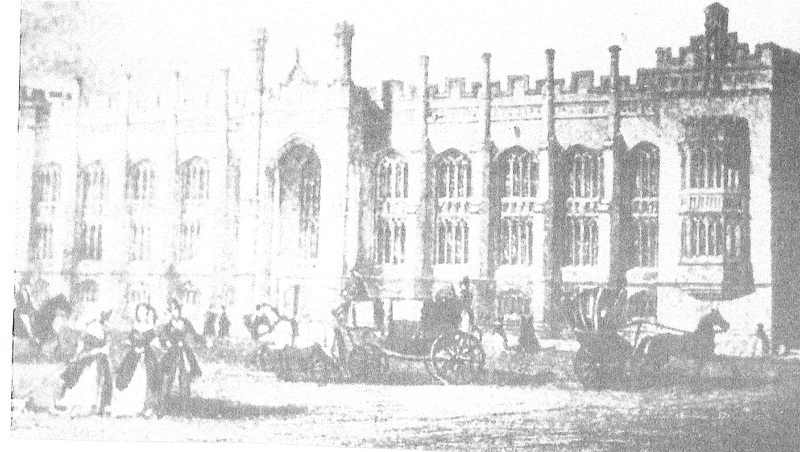 S. ‘Science in Ireland 1800-1930 – Tradition and Reform’ Trinity College. 1988. (2) F. Foden ‘The Examiner. James Booth and the origins of common examinations’. Leeds Studies in Adult and Continuing Education. 1989. First published in ‘t’ Magazine in August 2008 by kind permission of Simon Shaw (editor).